Exercise, for most folks, is hard to get around to doing. Our days are consumed by so many things that we simply don’t always feel there is enough time to add exercise to the mix. By the time we get up, get dressed, work all day, come home, make dinner, eat, wash dishes, chase the dog, pet the cat, do laundry, get a shower, and try to relax for five minutes, there often seems to be little time left to do much of anything else. That doesn’t even factor in those folks that have kids, and all the shenanigans that I can only imagine (for now) comes with offspring. In the late Summer of 2005, Hurricane Wilma came roaring across the southern part of Florida and left most of us without power, transportation, and necessities for days, and in some areas even weeks. The local weather coverage had prompted everyone to be prepared for a “mild Tropical Storm,” but they did not anticipate that the storm would gain strength while crossing over the Florida Everglades and pound the opposite side of the state, where I was, as a Category 3 hurricane. While nothing like the major disasters of Hurricane Katrina and the tsunamis in Indonesia and Japan, Hurricane Wilma still left us in a catastrophic predicament. Like fools, none of us had taken the forecast seriously after being told to expect nothing much more than a mild thunderstorm. Meanwhile, the gated archway at the entrance to my apartment community had succumbed to the winds and had landed in a heap of rubble (blocking our escape by car), roads were closed and impassable, power lines were laying on the ground with no indication as to whether or not they had electricity coursing through their veins, and a mandatory curfew was in place from dusk to dawn for all affected areas of southeastern Florida. Everything was a mess, and a dark mess too after sunset with no lights…anywhere. Because of all the lights, stars are not a sight you get to see in south Florida very often, so it was very surreal looking up and seeing them in all their sparkling glory. Word eventually got to us that some areas had power and supplies, yet there was no way for me to get to them. I was an easy 200 pounds heavy at the time, out of shape (unless you consider “round” a shape), and hadn’t made exercise a part of my life since grad school. It was then that I realized the perils of my choices that had left me physically incapable of getting from points A to B, so I vowed that I would never get stuck in that same situation again. 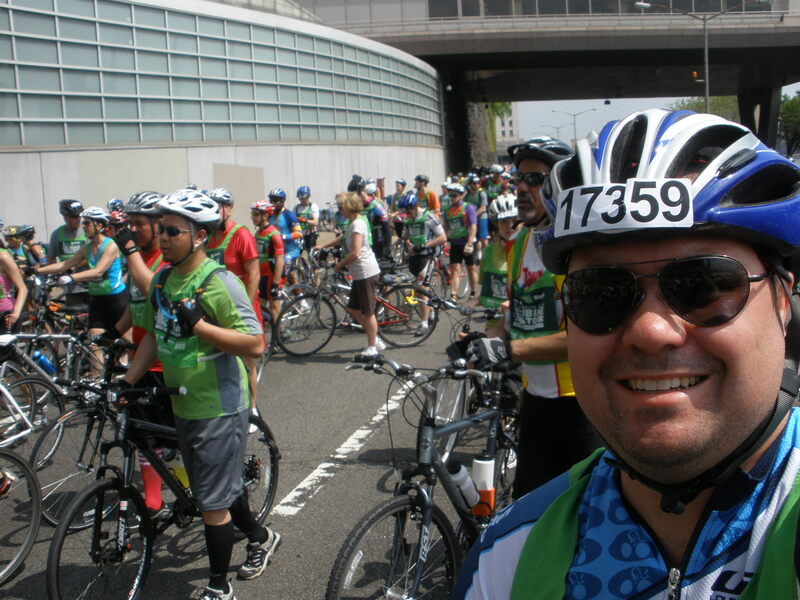 …and by the following June I did my first 26 miles in an organized charity bike ride. My 1st organized bike ride + hair + heft. By the end of that Summer in 2006 I felt that I’d earned a better bike, so I got a Trek 1500 as my first road bike, and I have been pedaling ever since. I’ve wrote before about how cycling benefits me both physically and mentally, and long endurance riding comes with its own share of challenges, but I know now that in an emergency I could absolutely get from points A to B, and probably to C and back again if the situation called for it. 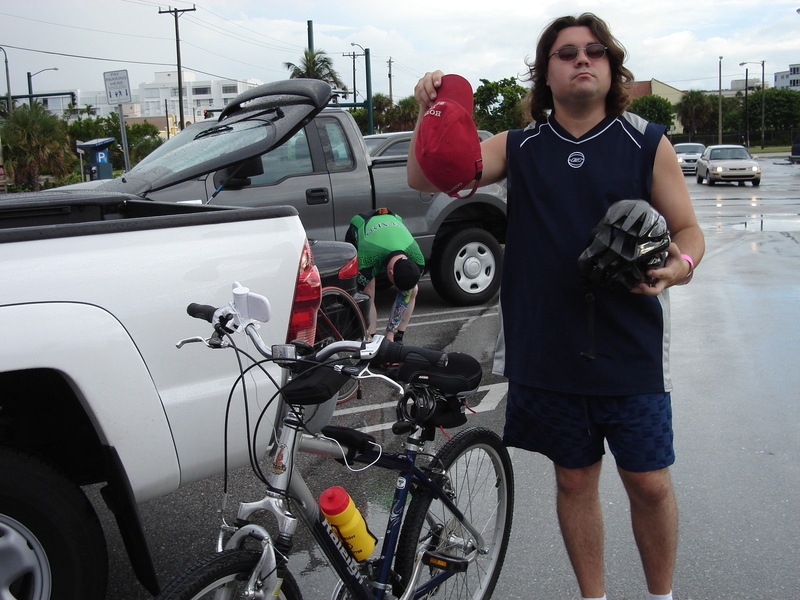 Last April I completed my third 150-mile bike ride from Miami to Key Largo and back. 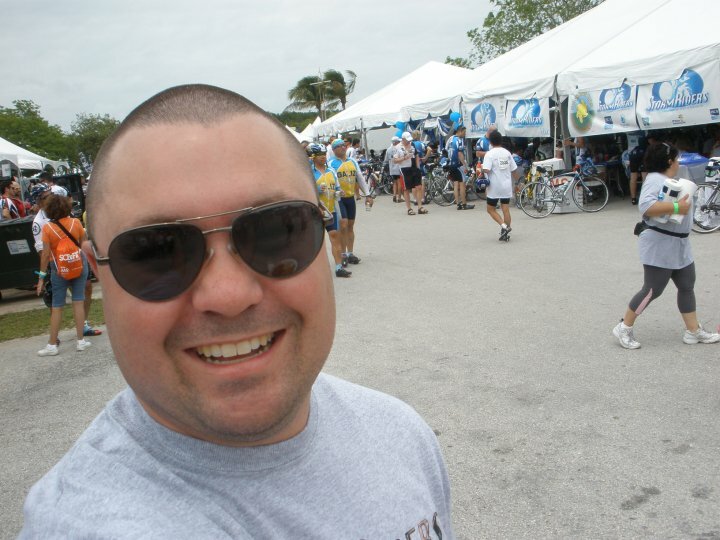 Outside of the Team Stormriders tent in Key Largo, my 3rd MS150 with the team. In my case, dropping the weight and getting fit was a side effect of my desire to be able to get to where I needed to go. In doing that, I discovered a passion for a sport that has partially defined who I am today. No matter your circumstances, don’t wait for a force of nature to force you to exercise. Get moving now, and be the master of your own disaster! This post is my March entry in the DSMA Blog Carnival. If you’d like to participate too, you can get all of the information at http://diabetessocmed.com/2011/march-dsma-blog-carnival. I am part of the Diabetes Social Media Advocacy community, and each Wednesday night we have a live chat via Twitter where we answer questions and discuss topics relating to life with diabetes, followed by a live internet radio call in show on BlogTalk Radio on Thursday nights. The following blog post is the newest diabetes advocacy initiative of DSMA, the DSMA Blog Carnival. Each month a question will be featured, and participants are given the opportunity to expand on the answer with a dedicated blog post. 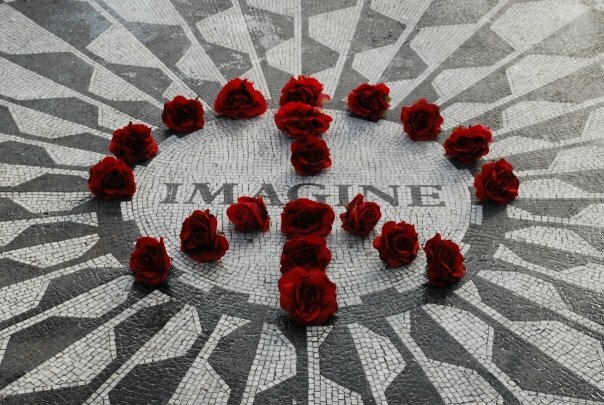 Here is my contribution for February 2011. I remember being a child in elementary school and seeing my friends eat candy bars and gummie bears, drink their little juices, trade snacks, and even barter for Moon Pies. On Halloween and Valentine’s Day they would bring in candy and trade, or hand out candy canes at Christmas. I would always accept the candy, and be part of the group, but I’d never eat it. I would take it home and it would get tossed in a drawer or a basket, and eventually find its way to the garbage due to old age. I didn’t feel out of place or like an oddball during those days. It was just the way it was. I didn’t know any better, and quietly accepted the way things were. As an adult, I don’t accept things quite that easy. Where some doctors or diabetes “experts” say that you have to limit yourself because of diabetes, I ask, “Why?” I find absolutely no logical reason why I have to limit myself to anything in this world that I want to achieve strictly because I have diabetes. As an adult with diabetes, I have become a cyclist, pedaling thousands of miles on my bike and keeping up with people both younger and older than me in quests for a finish line that is often many miles away. I have become a librarian, teaching people how to find information that they can use to do everything from satisfy curiosity to save a life. I have become an adventurer, exploring cities like Miami, Ft. Lauderdale, New York, Las Vegas, and Washington D.C. without limits. I have become a contributing member of the Diabetes Online Community, a blogger, a voice, and a soldier in an army of People With Diabetes. I have become ME, and that is the most awesome thing that I have done in spite of diabetes. This post is my February entry in the DSMA Blog Carnival. If you’d like to participate too, you can get all of the information at http://diabetessocmed.com/2011/introducing-the-dsma-blog-carnival.